2003 was a year with very low water levels in Norway and Sweden. Not only wind, but also obsolete coal fired power plants scheduled for decommisioning were running flat out exporting electricity to our Scandinavian neighbourghs. Take a look at pages 19, 29, 30, 31, 32, 33. On page 10 you can see that resedential consumption in Denmark stayed virtually flat. Think about it; why would Norway buy expensive Danish wind power if they have near free hydro power..? Because they needed it! Spinning reserve is not a new feature of wind energy. A spinning reserve corresponding to that largest producer or transmission line on the grid has always been required. Wind turbines increase the required reserve proportional to the absolute uncertainty of the predicted power output. "If the annual average load factor is back-calculated over the five-year period, it is only 14.7%. ..."
As I mentioned above, Norway and Sweden only buy Danish wind power because they need it. Did you imagine that they bought wind power only bypass water away from the water turbines..? Get real! Hydro power plants produce exactly as much hydro power as rain fall allows. No more, no less. I have many more comments that I'd been writing on for post 211. I just didn't finish it. I will do so momentarily and post it in 211. 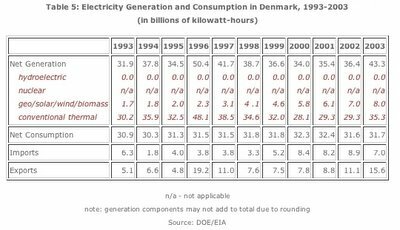 To see the Danish Electricity Supply 2003 report, you have to find the link youselves on the page that I've linked to. And the only way to deploy renewables by themselves is by large scale storage. That will make wind extremely expensive to work with. From I have read renewables (wind) + nuclear are complimentary rather than competitive i.e. we need both. Do you think that Denmark can go 100% wind without baseload from thermal or hydro plants? For renewables to appreciably decrease fossil fuel use, they have to be broad based (wind, solar, hydro, tidal, geothermal, etc) and be combined with storage capability. Currently, storage technology is lagging. Eventually, storage will catch up, and renewables will have their day. By that time, fusion may just be getting started. Note that the spinning reserve can be filled much more effectively using hydroelectric capacity, when it is available. Unlike thermoelectric plants, hydro can be turned on and off fairly quickly. During low demand periods (i.e. when the wind turbines are working at close to capacity) the reservoirs fill up, and during high demand they empty. No, I don't think 100% wind power is possible - especially if you exclude hydro power as storage. Besides, I would never bet on just one type of renewable. Wind and solar complement each other quite well. There are not many days with neither wind nor sunshine, especially not if the connected region is large enough. I have a sneaky feeling that you are enquiring about wind energy in Britain and the ongoing discussion about future power supply. Britain has what is possibly the best wind resource in the world and it would be a great shame not to utilise it, at least up to 10%. I do not know how large your cross-border transmission capacity is, but I assume it is negligible. Therein lies your challenge, I think. Wave power (if it ever becomes feasible) would complement wind power quite well, since the waves typically come after the wind has passed. But most of all, you need better connections to neighbouring countries, see Fig. 27 and 29 in the EWEA report for inspiration. On page 12 they do not quantify how large a fraction of wind power is "lost" to spinning reserve. They make it sound almost like no fossil fuel is saved. That is what I would call 'blatant disregard for the laws of thermodynamics'. Or something to that effect ;-). The loss of saved fuel is mainly due to decrease in thermal efficiency when running in part load. Still, when you turn back the throttle, you save fuel. I'm not sure I understand the phrase about 40% of newly installed wind power being covered by thermal power. Maybe they are referring to the fact that incremental integration of wind power comes at an ever higher price, which is true. 40% seems very high, though, and, evidently, still a matter of debate. Another problem we have in western Denmark, exacerbating the need for spinning reserve, is the fact that all the small decentralised CHP (combined heat and power) plants also operate whenever they feel like it, and the grid operators have to take it, whether they like it or not. (Bonus info: the decentralised CHP plants were built to utilise our natural gas resources and bring district heating to small towns out of reach of the large central (also CHP) power plants) Eltra (the former electricity distribution company in Jutland) stated a couple of years ago that if they were allowed to shut down small CHP plants in periods of high winds, they could easily accommodate much more wind power. This problem is not technical. Neither are many of the other perceived problems with wind power, but merely economical and political. Solvable problems! As a matter of fact, I believe these problems are in the process of being solved right now. 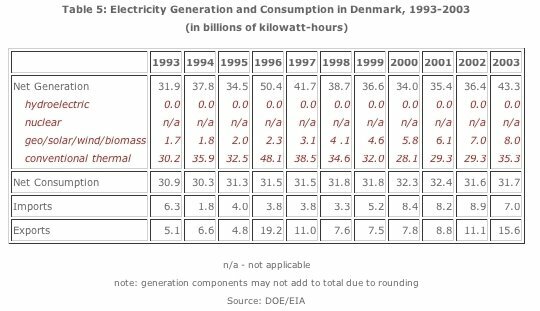 Wind power in Denmark has been criticised for the fact that, on a few occasions, wind power has exceeded our national consumption. There have been occasions where we have had to pay to export the power to Germany. (Because grid operators have to buy it from private wind turbine owners) This problem is now being solved by allowing electrical heaters to be installed in hot water storage tanks at CHP plants. Some have criticised this approach, arguing that wind power (all electrical power for that matter) is too pristine to be wasted on heat, which is low quality energy. Personally, I am strongly in favour of this approach. Wind power is no longer an ideological pet project in Denmark. It is very real and has to be perceived as such. I welcome the time when we get most, if not all, of our heat energy from wind power. After Peak Oil has come and gone, I can easily envisage a reversal of opinion, where natural gas is suddenly too pristine to waste on heat. One more thing I would like to say about integration of wind power. We are still learning how to do it! It will take many years before Britain has achieved 10% wind power (net production, not capacity) and we will all be wiser then. So there is no excuse for not getting on with it. About wind and nuclear complementing each other. I would be happy to learn that this is possible. If you have sources on that, I would be interested. However, as far as I have heard (and commented under post 211), nuclear is most of all base load power which does not do well with load cycling, not even slow ones. They are so slow that France has had problems coping with the traditional max/min loads of a single day. To solve the problem, I believe they have persuaded heavy power users to delay consumption to night time whenever possible. It is my turn to apologise for not replying sooner. I have no particular interest in the UK (I do not live there), except of course the natural curiosity out of the simple fact that they will be the first to address the energy situation. 1) Regarding my previous statement concerning the complimentarity of wind+nuclear: Nuclear IS for baseload + Wind (with storage) to address peaking. In the US, pumped hydro plants are used to "store" nuclear electricity off peak and make it availabe the next day when the electricity demand picks up. The same "technology" (pretty old actually!) can be used to buffer wind so it is a win win situation if you ask me. 4) Storage and grid interconnection will enable a much higher penetration of wind, and by strengthening the grid nuclear and thus enable us to displace NG plants. "As I mentioned above, Norway and Sweden only buy Danish wind power because they need it. Did you imagine that they bought wind power only bypass water away from the water turbines..? Get real!" That's patently false. We buy Danish wind power here in Sweden for one of two reasons. The first and biggest reason is that we can buffer your wind power with hydro power peaker plants(allow reservoir to fill when the wind is blowing) and then sell electricity back to Denmark with a mark-up when the wind isn't blowing. It's a classic arbitrage opportunity that our excess hydropower peaking capacity allows us to exploit. The other and lesser reason for buying danish wind power is foolish renewable energy targets that require the use of renewables whether or not it is cost effective and whether or not it does a damned thing to reduce CO2 emissions(it doesn't; nuclear power and hydro supplies 95% of the power to our grid and new nuclear is much less unthinkable than fossil fired generation).